Did you know residential waste is made up of 40% compostable materials? And that Hong Kong's three landfills, in the New Territories, are nearing their maximum capacity and will be full in 2015, 2017 and 2019 respectively? By doing something as simple as composting your food waste – you could help extend the life of our landfills, as well as reduce greenhouse gas emissions, save money on buying pre-made chemical fertiliser, reduce your environmental impact and improve local soil quality. Compost can even suppress plant diseases and clean contaminated soil, while chemical fertilizers provide only a quick burst of a limited number of nutrients to plants, and eventually washes away – polluting our rivers and streams. 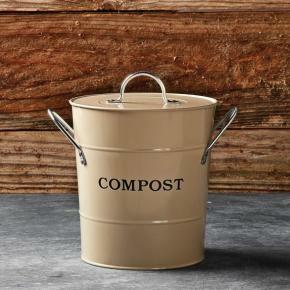 Composting is super easy, too. All it takes is layering your food scraps with newspaper and soil, and turning it on a weekly basis. How easy is that? From eggshells, to dryer lint, to cereal boxes and pet fur, almost anything can be composted – even diapers! The Tumbleweed 220L Compost Tumbler is ideal for small gardens and courtyards – you can even place it on concrete or pavers. All you need to do is load the barrel then turn it every few days. Made from 100% UV protected recycled plastic, this unit will leave you with fantastic mulch in just four weeks or rich compost in six. Designed for the ‘lazy’ composter, this system allows you to drain any unwanted fluids from the rest of the food material in a dual bucket structure that, ideally, fits right under the kitchen sink. This compact, 15L bin has the ability minimise the number of trash bags you throw away every week to just one. This uber stylish 3L bucket is ideal for teeny-tiny Hong Kong apartments. Made of durable steel construction with rustproof powder-coat finish, its airtight seal-on lid helps control odours and the removable inner plastic bucket with handle simplifies emptying and cleaning. Buy it: Online, at www.williams-sonoma.com. Please note that the price excludes international shipping costs. 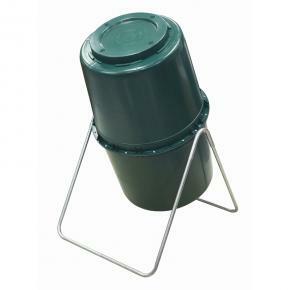 TIP: Don’t want to buy a composter? No problem – you can create a mini compost at home quite easily. All you need is some outdoor space, a bin, a little soil and some newspaper or dried leaves. Simply add a layer of soil and torn up newspaper to the bottom of the bin, and start adding food waste. As the waste piles up, add more newspaper and leaves. Stir it once a day, or more, to keep it aerated and to prevent any funky smells. In a matter of weeks, you’ll have your completed compost, ready for your herb garden or flower pots.